Everyone should have a good flashlight, at least in my opinion. Nightstick is starting to be one of my favorites. Recently they introduced a new series of USB rechargeable tactical flashlights. After reading the press release, I asked if they would send one out. Nightstick sent the USB-556xl. The 556xl is a single cell LED flashlight with a max output of 750 lumens. The usb-556xl is packed with features. As one could guess, it is USB rechargeable. It comes with a little usb cord also, but not the charger. In today’s world, finding a usb charger is easy enough. Since I am on the usb, the 556xl has a built in micro-usb charging port. The port is hidden underneath part of the handle. One must unscrew the center section and then slide it down to reveal the usb port. It is not the easiest to unscrew because of the o-rings used to seal the flashlight charging port. There is also a tiny light above the charging port. The light is red when charging, and green when fully charged. Nightstick says it takes 4 hours to fully charge, and that seems correct, but I never actually timed it. While I like the usb charging function, the 556xl does use a proprietary lithium-ion battery. Once charged, just slide the cover back on, and screw it closed. Since the usb-556xl is a tactical light, it has options that are quite useful. For instance, it uses a push button tailcap. The light will automatically shine on high, momentarily, if you push the button part way down. Of course it then turns off when released. Also, if you push the button all the way in, it turns on, on the high setting. To get it into the medium or low setting, hold the tailcap down while the light is on, then release pressure when it gets to the setting you desire. Once the light is turned off, it defaults back to the high position. This is probably my favorite function. Because when I want the light on, or need it on, having it on the high setting is ideal. The light also has a strobe function. To access the strobe, you have to push the tailcap button all the way down, twice, quickly. It only strobes at the high output, but can be turned on from either low, med, or high while the light is on. I prefer lights without a strobe, but Nightstick doesn’t offer this light without a strobe function. I would like the button to be inset farther into the tailcap, that way one could set the flashlight down on a flat surface, and have it shine upward to illuminate a room or something. I seldom use a pocket clip, but the 556xl has one. Mainly the light just gets put in my pocket, but some people find the clip useful. The clip on the 556xl isn’t that great. It works, but is a little flimsy or thin. The clip is easily removed also. One advantage to the removable clip is that it can be turned around. By doing so, it can be clipped to things, letting light shine outward away from it. I actually did this and clipped it to a hat bill. So everywhere I looked, the light was shining. Kind of like a headlamp. Specs, everyone wants to know these. First up, the light is bright. On high it is rated at 750 lumens and 9350 candela. Medium is 250 lumens and 2950 candela. Low is 80 lumens and 1115 candela. You get a 1hr/2hr/5hr runtime at the above settings. So pretty good for a 750 lumen light. I loved these, the high setting lights up my backyard better than my porch light. On high the beam wasn’t too wide and the light shines pretty far. I do use the medium setting alot. It is useful for finding dropped screws and such. Not too bright, but not too dim. I hardly use the low setting, it is a little too bright for finding stuff in the car at night. But then again, the low setting works good if you need to see where you are going, especially if there isn’t much ambient light. The 556xl can be submerged up to 1 meter for 30 minutes before something bad might happen. At 4.7” in length, it is not too big for pocket carry. It also only weighs 4.4 ounces. The body on the 556xl is 1” wide, and the head is a little larger at 1.2”s. If you like black, your in luck, because you can have any color, as long as it’s black. But, it is a class III anodized aluminum body, so it should last a long time. This light has been in my pocket, everyday for almost 6 months. It shows some wear, but not too bad. I really like how it can be charged just about anywhere. At 750 lumens, it is bright enough for anything I need. It doesn’t classify as “all the lumens,” but what can you expect for a single cell light. I’ve dropped it on concrete, in water, and it keeps on working, the lens isn’t even scratched up. 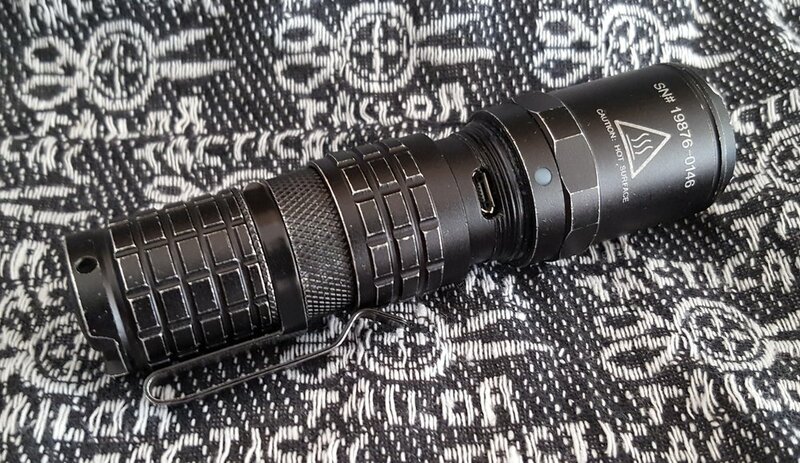 Do I think this is a decent tactical light? The answer would be yes, even if it has some minor flaws. If you are looking for a decent flashlight, the Nightstick usb-556xl is worth looking into. I really like the usb charging feature. It has good runtime, especially if you don’t use it on the high setting. At around $100, it’s not cheap, but is in the same price range as competing models. Do yourself a favor and go checkout Nightstick, they manufacture all different types of lights.